The Blackboard discussion board allows for threaded discussions to take place in your Blackboard course. The board can be split up into Forums, which may be used to separate discussions on different topics. Within each forum users may post threads (as in “threads of a conversation”), which are the conversations themselves. A user may post a new thread (usually a question or statement calling for a response) and other users may then reply to that thread, creating a discussion. If you have set up a Blackboard avatar your chosen picture will appear beside your posts. 1. Access your course and find the link the instructor has placed to the discussion area in the course menu. If such a link does not exist then click on Tools and then Discussion Board. 2. A list of forums available will be shown. Click on the name of the forum to enter it. Note that you can immediately see any replies to you in the “replies to me” column. Click on the number to view them. 3. You will be presented with a list of “threads”. Threads are individual topics of conversation. A thread may have a number of messages within it – this is displayed to the right. Click on a thread to read it. Note: If your course instructor has enabled it you may click on the Subscribe button to receive email notifications of new posts to the discussion board. You can also see any replies to you under the “replies to me” column. 5. You can reply to a message by clicking on the reply button. 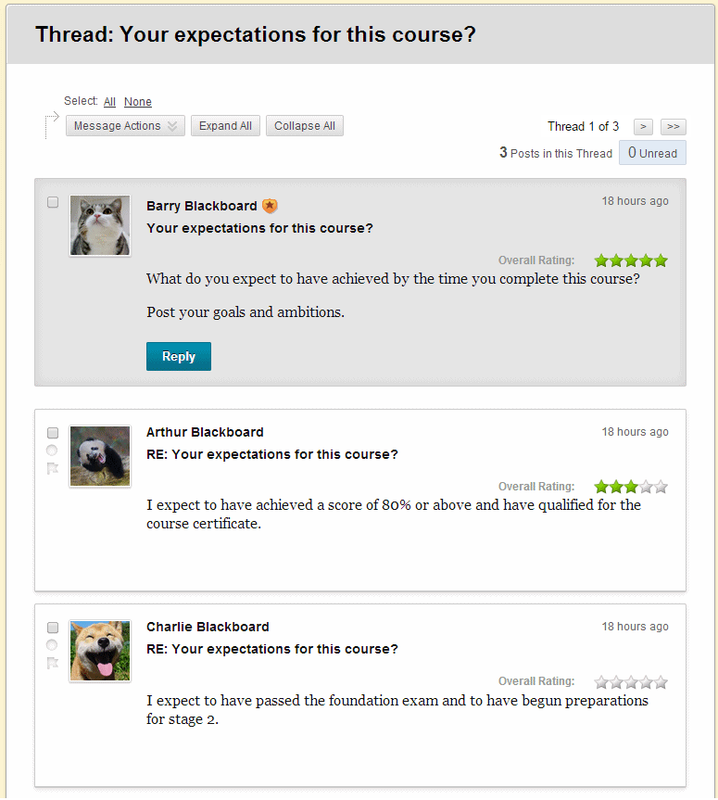 Note that it may be possible to give a message a rating out of five if this has been enabled by the course instructor. If the instructor has enabled it you may use the quote button to reply to the post, including a quote from it. 6. You can start a new thread (i.e. a different topic), provided this has been enabled by the course instructor, by clicking on Create Thread. 7. When you reply to a message or create a new thread a text box will appear into which you should type your message. Note that you may see more buttons in the text editor by clicking on the icon encircled in red in the above screenshot. This will give you options to add photos and embed YouTube videos. 8. If anonymous posting has been enabled on the forum you can post anonymously by ticking the Post Message as Anonymous tick box. 9. When you have completed your message click on Submit. Note that clicking on Save draft will save a draft of your message, but no one will be able to view it. It is recommended to only use Submit. It is possible to send emails to people on the same Blackboard course as you. 1. 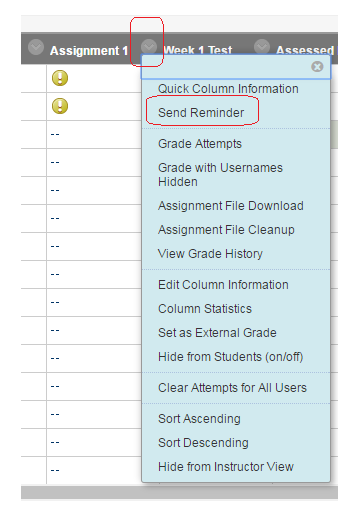 From your course Control Panel, expand the Course Tools section and click on Send Email. 2. Select to whom or which group you wish to send an email. 3. Enter a subject and message for your email. 4. A copy of the email will be sent to you. 5. If you tick “Return Receipt” the email copy sent to you will state to whom the message was sent. If you do not tick the box this information will not be included in the email you are sent. Using this option does not mean that you will be notified when a recipient views the message. 6. If you wish you may attach a file to your message. 7. Click on Submit to finish. Did you know you can use the Instructor Quick Tools to send emails to multiple courses at once? 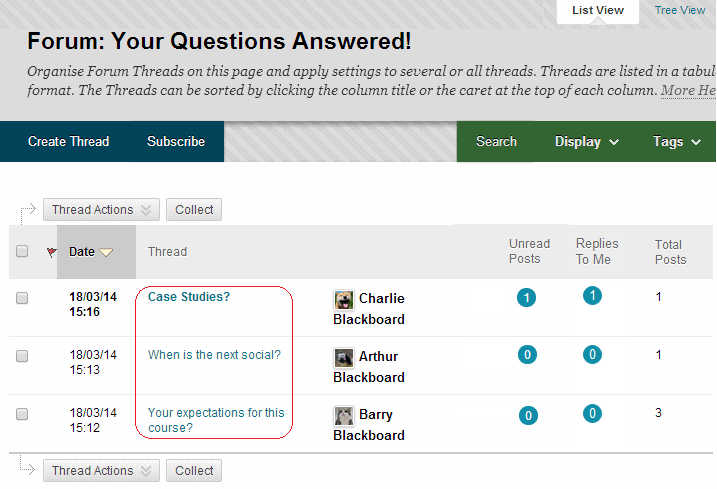 The Blackboard discussion board allows for threaded discussions to take place in your Blackboard course. The board can be split up into Forums, which may be used to separate discussions on different topics. Within each forum users may post threads (as in “threads of a conversation”), which are the conversations themselves. A user may post a new thread (usually a question or statement calling for a response) and other users may then reply to that thread, creating a discussion. 1. First we recommend that if your course menu does not already have a link to the discussion board you should add one so that your students can find it. If your course menu already has a link to the discussion board you can skip on to step 8 below. 2. To add a Discussion Board menu item, click on the + symbol in your course menu while in Edit mode. 4. Enter a Name e.g. Discussion. 5. Select Discussion Board from the Type drop down menu. 6. Tick Available to Users, otherwise students will not see this menu item. 8. You may re-order your menu item if you wish by dragging and dropping the up and down arrow icon. 9. Click on the menu item you have created to enter the discussion board. 10. Click on Create Forum. 11. Enter a Name for the forum. This should quickly convey what topic the forum will be used to discuss. 12. Enter a Description for the forum. It is helpful to explain how the forum should be used and how regularly you (the tutor) will check it. 13. Leave Available set to Yes so that students will be able to see the forum. 14. Enter date and time restrictions on when the forum should be available only if you wish. 15. Set the forum settings according to your preferences. It is possible to go back and Modify your forum later if you wish to change these. In standard mode students may use the forum without having to make a first post. If this option is selected students must first create a thread of their own before they may view the rest of the discussion forum. Select this option if the forum will not be assessed. Enter a point value to evaluate participants on performance throughout the forum. allows you to mark individual threads. Setting this option is not usually recommended due to the high workload for the instructor. Depending on the features you enable you may allow both students and staff on your course to “subscribe” to the discussion board so that notifications are sent to users depending on features that you enable. Selecting this option will not make any subscription features available within this forum. This gives users the opportunity to “subscribe” to single discussion board threads. If this option is set and the user chooses to they can receive an email alert when a post is updated or a user posts a reply. This option is not recommended since it would require users to subscribe to every thread they are interested in. Recommended. This option allows a user to “subscribe” to the whole forum. They will be notified of all changes to the discussion forum such as new posts and replies to any existing threads. This option is recommended. – Include body of post in the email. Use this option to include the message text in the email notification and a link to reply to the message. This is not recommended since we find that students will reply to the emails under the mistaken assumption that their replies will be added to the thread. – Include link to a message. Use this option to include a link to the message in the email notification. This option is recommended. Ticking this box will allow your students to choose to post anonymously if they wish. This allows the author to remove their message later on. It is not recommended to select this option because if a post is removed the flow of the thread will be disturbed. If a user deletes their message any messages which were in reply to the deleted message will also be deleted. Setting this option will only allow users to remove a post provided no one else has replied to it. This is a better option to use than ‘All Posts’. This allows the author of a message to go back and edit it later. Turning on this setting allows students to start new threads (i.e. start new topics of conversation). It is recommended that you set this option otherwise your students will only be able to reply to threads that you create. 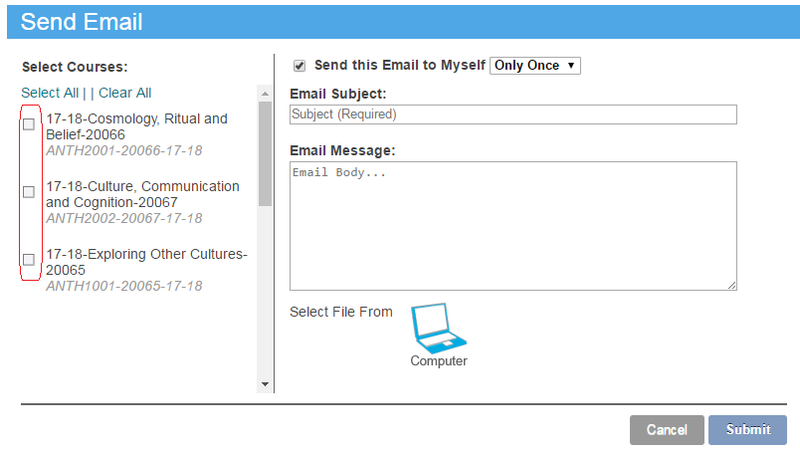 Setting this option will allow students to add attachments to their messages. If this options is selected then when users reply to a post they have an extra option to quote the post to which they are replying. Moderating posts requires that all posts are reviewed by a responsible party before the content is shared with the class. If this is enabled then users with a discussion board role of Manager or Moderator can click on Moderate Forum to view a “Moderation Queue” of posts that are awaiting approval. Then they are able to Publish a post or Return it back to the user. This allows discussion board messages to be tagged with meta data. The ability to tag is only available when posts are viewed through the collect view. We do not recommend turning on this option because Blackboard have warned of adverse effects to the performance of the discussion board when this option is enabled. If this option is enabled each user can respond to a post by rating it using a 5-star rating system. 16. You will see summary information about the discussion forum you have created. You can go back and use the Modify button (highlighted in red) to change the settings at any time. For details of how to post a message, read the guide here. 17. Note that clicking on Manage using the Modify button menu allows you to change the level of access users have, for example setting students as forum moderators. See this section of the online Blackboard manual for full details of the different roles. Announcements can be used to keep your students informed of news and reminders relating to your course. Discussion Boards can be used to facilitate asynchronous discussion within your Blackboard course. Weblogs, or simply Blogs, can be used within your Blackboard course. You can set up blogs for the whole course, for groups, or for individuals. Full step by step instructions are available. Use this guide to find out how send emails from within your Blackboard course. Use this guide to find out how to post a message into a Blackboard Discussion. Wikis allow for collaborative creation of content by any member of your Blackboard course. Full step by step instructions are available. Blackboard is able to send notifications to you for a number of events, for instance when new content is added to a course. You may configure which notifications you receive from Blackboard and how you receive them. This guide takes you through the process. It is possible to embed a Twitter feed, into a content item or announcement that you add to your Blackboard course. Note that this method may stop working if Twitter change the way their service works. Twitter is a third party web site and iSolutions cannot be held responsible for the content held on it. iSolutions does not support Twitter. Users should read the Twitter terms and conditions. 2. Enter into the text box what you would like to embed. 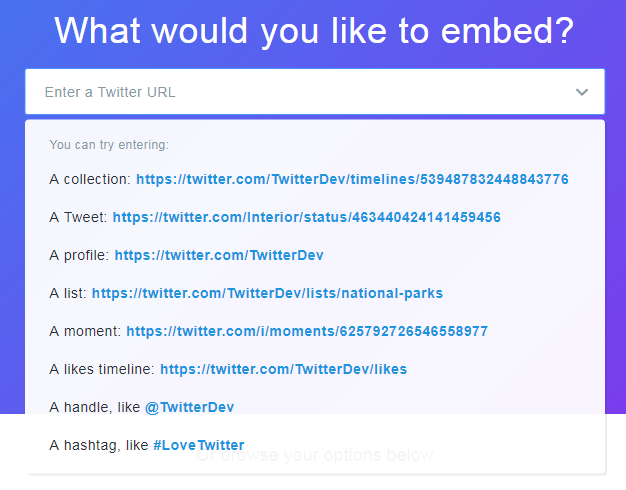 Note that it is no longer possible to generate twitter embeds for a search term or hash tag. 3. 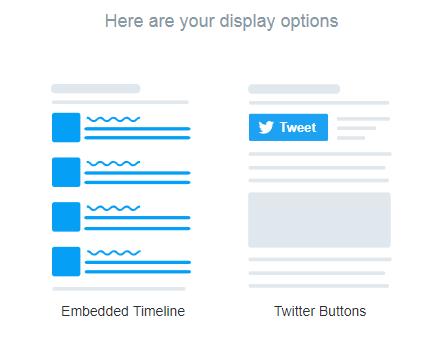 Depending on what you have chosen you may be asked if you prefer an embedded timeline or a twitter button. Embedded timeline is most commonly used. 4. You may be asked to set customization options. The twitter website will explain what these are. 5. Click on the Copy Code button. 6. 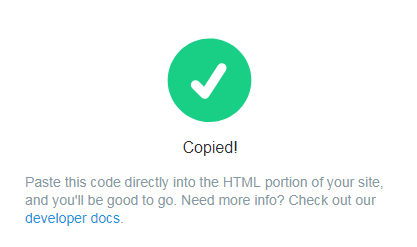 A prompt will confirm that the embed code has been copied. 8. Identify where in your Blackboard course you would like to place the feed, add the item, announcement etc. Add the item desired. 9. Set a Name, and any relevant text in the text box. 10. Click on the HTML button within the text box to open HTML mode. This will allow you to enter the HTML code required to embed the twitter feed. 11. Paste the text you copied into the clipboard from Twitter into the Blackboard text box. One way to do this is to right click within the text box and choose paste or press CTRL + V. Click on Update to finish. 12. Scroll to the bottom of the page and click on the Submit button. 13. The twitter widget you have chosen will now be embedded. Announcements are useful for communicating short items of news about your course. Examples could be an announcement about: a change of venue for a seminar, a reminder of a deadline, or to let students know that you have added some new material to your Blackboard course. 2. To get to the announcements screen either click on Announcements from your course menu, or go into the Control Panel, Course Tools area and click on Announcements. 3. Click on Create Announcement to add a new announcement. 4. Enter a subject for your announcement. It is best to keep these short and meaningful. You may also set the colour of the announcement. 5. Enter the announcement message. You can set the announcement to either by Not Date Restricted or Date Restricted. 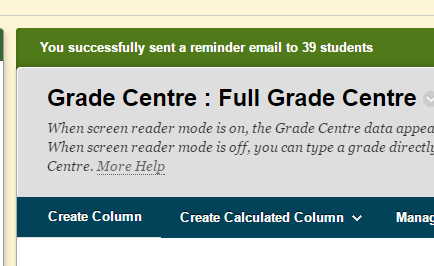 If the announcement is Not Date Restricted then it will be visible to students until the setting is changed. If it is date restricted it will be visible only according to the date restrictions which will appear below when that option is set. 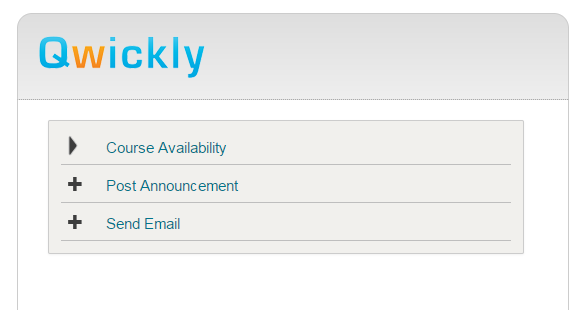 Select the range of dates in which the announcement will appear. To display an announcement from a date forward, tick and select a date in the Display After area but do not select the Display Until option. To display an announcement for a specific amount of time tick and select a date in the Display After field, check Display Until, and select a date. 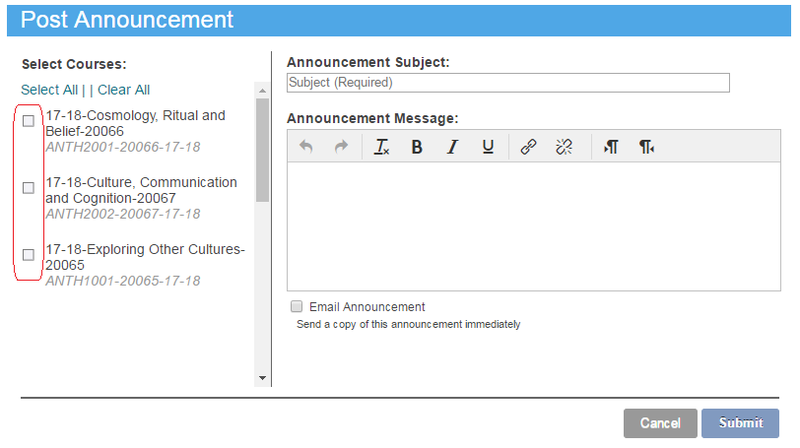 Note: if you set the announcement to appear in the future, email notifications will be sent only to students who were on the course when the announcement was created, not when the announcement was set to be released. If a student decides to opt out of receiving announcements via email then ticking this box will over ride that setting and send the announcement anyway. In addition Blackboard (the vendor) have confirmed that there is a bug with the way announcements are sent via email. In some rare cases the email will not be sent to students. This bug is due to be fixed in a future Service Pack. 7. You can use this option to link to an area of your course, clicking on Browse will open the course map. You may then choose an area and select it. When the announcement is posted students will be able to click on that link to go straight to that area of the course. This can be useful if you wish to highlight a new part of your course and give your students an easy route to access it directly. 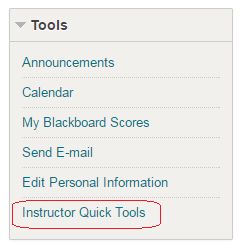 Did you know you can use the Instructor Quick Tools to make announcements on multiple courses at once?